We’d love your help. 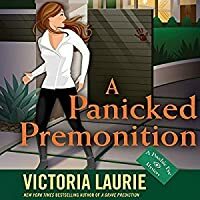 Let us know what’s wrong with this preview of A Panicked Premonition by Victoria Laurie. Professional psychic and FBI consultant Abby Cooper has used her inner visions to get her out of many a scrape and solve many a crime but she s about to face a murder scene that will put all her powers to the test. Abby s husband Dutch has a side business providing security and building panic rooms for wealthy clients. One morning, one of Dutch s partners, Dave, goes missing on his way to meet a client. Abby s intuition tells her something terrible has happened to him. To ask other readers questions about A Panicked Premonition, please sign up. Will Abby and Dutch ever have kids? I mean I feel like its a no but I can't help but wish she got preggers. And will the next book bring in conflict with her mother aka Claire because I feel like it's been hinted at throughout the last 4 installments. I would love to see Claire come in and what Dutch' reaction would be. Oh, and I LOVED that Abby was doing a little matchmaking for (view spoiler)[FBI Agent Oscar Ramirez and APD Detective Nicky Grayson (hide spoiler)]. Would love to see THAT relationship flourishes! This is the fifteenth book in the psychic eye series and I think it is one of the best in the series. Abby and Candice's husbands are FBI agents but who also have a side business with their friend Dave installing panic rooms and security for rich clients. When one morning Dave's wife calls Abby to say Dave never came home and if Abby has seen him, they realize he is missing. They trace his movements to one of the clients houses and in turn finds the family murdered along with the maid and the ga This is the fifteenth book in the psychic eye series and I think it is one of the best in the series. Abby and Candice's husbands are FBI agents but who also have a side business with their friend Dave installing panic rooms and security for rich clients. When one morning Dave's wife calls Abby to say Dave never came home and if Abby has seen him, they realize he is missing. They trace his movements to one of the clients houses and in turn finds the family murdered along with the maid and the gardener. The local police think Dave killed them for the money in the panic room safe, But Abby, Candice, Dutch, and Brice don't think that's what happened. Abby uses her psychic abilities to try to help piece together clues to what happened. This is the fifteenth book in the Psychic Eye series and the first one that I have read. After some initial fear that I wouldn't know enough, I began reading this and was quickly drawn into the story. Abby Cooper is a professional psychic married to an FBI Special Agent named Dutch who has a side business providing security and panic rooms to the very wealthy. She works with her friend Private Investigator Candice who is married to Dutch's partner Brice. After one of Dutch's partners, Dave, goes This is the fifteenth book in the Psychic Eye series and the first one that I have read. After some initial fear that I wouldn't know enough, I began reading this and was quickly drawn into the story. Abby Cooper is a professional psychic married to an FBI Special Agent named Dutch who has a side business providing security and panic rooms to the very wealthy. She works with her friend Private Investigator Candice who is married to Dutch's partner Brice. After one of Dutch's partners, Dave, goes missing seemingly between clients, Abby feels that something is very wrong. Things get even worse when two of Dutch's clients are brutally murdered in their panic room. Dave is the prime suspect. Then Dave's wife Gwen goes missing. Abby, Candice, Dutch and Brice have to find their friends Dave and Gwen and solve the murders to keep Dutch and Brice's business from being sued into extinction. There are lots of wonderful suspects from the rich barracuda who has been hitting of Dutch and once had an affair with one of the murder victims to the same victim's sister who resented her sister's success to the other murder victim's business partner who is scrambling to find a computer program the victim wrote that will keep their company from going under. I loved the relationships between the characters. It is nice to see strong marriages in stories where the partners both love and support each other. Abby also has a unique, quirky way of look at the world and we see this clearly as she is the narrator of this story. Abby and Candice is doing everything in their power to find a friend before it is too late. If doing so will save their husbands business as well it will be totes amazing. This could easily have been a five star book if it wasn't for a few pesky issues. Abby has grown a lot since the first book. It is one of my favorite things about this series. No book is exactly the same. However, I have noticed that Laurie is starting to lose track of her characters and the case seemed to drag on for almost eve Abby and Candice is doing everything in their power to find a friend before it is too late. If doing so will save their husbands business as well it will be totes amazing. Abby has grown a lot since the first book. It is one of my favorite things about this series. No book is exactly the same. However, I have noticed that Laurie is starting to lose track of her characters and the case seemed to drag on for almost ever until snap the case is suddenly solved in two minutes. We have known for quite some time now that Abby can 'zone' in on a person by 'feeling' out a person connected too them. I don't understand why this is new information in this book. One of Dutch’s flirting clients insists on a meet and greet with Abby. Then, she requests Abby to do an unethical psychic reading of a man, which Abby refuses to do. Dave, the contractor, disappears in mysterious circumstances. The murders begin -- connected with their side business of panic room installations. Find A Panicked Premonition at the Westminster Public L One of Dutch’s flirting clients insists on a meet and greet with Abby. Then, she requests Abby to do an unethical psychic reading of a man, which Abby refuses to do. Dave, the contractor, disappears in mysterious circumstances. The murders begin -- connected with their side business of panic room installations. Find A Panicked Premonition at the Westminster Public Library. This review has been hidden because it contains spoilers. To view it, click here. This book wasn't as enjoyable as others in the series. I don't think the author is interested in this series anymore and just threw this book together. It seems like more time went into the heroine's new gluten-free and exercise lifestyle than the psychic aspect of the book. The whole reason I read this series is that it is supposed to be a Psychic Eye Mystery but the psychic focus really took a back seat here. Also, the middle of the story really dragged and was a chore to get through. I think This book wasn't as enjoyable as others in the series. I don't think the author is interested in this series anymore and just threw this book together. It seems like more time went into the heroine's new gluten-free and exercise lifestyle than the psychic aspect of the book. The whole reason I read this series is that it is supposed to be a Psychic Eye Mystery but the psychic focus really took a back seat here. Also, the middle of the story really dragged and was a chore to get through. I think the author probably agrees because she made a story blunder and even the editors didn't catch it. It seemed strange that she couldn't remember killing off Dave's mother 23 pages earlier. Continuing Spoiler alert. This series has been a pretty humorous and cozy mystery set. Yes, there have been murders but nothing as violent as this book. The book also contains a victim that is raped. It and the other violence just all seemed out of the scope of the series. I just hope the next book returns its focus to Abby using her psychic gifts to solve crimes. Nice story, but I thought Abby's physic ability was underused. Not that the suspense wasn't great, but I thought the whole point of the series is for Abby to use her sixth sense to help solve the case, with (understandable) minor roadblocks here and there, rather than dead ends (no pun intended). Honestly, it just felt like a normal murder mystery. Fantastic addition to the Psychic Eye Mystery series! What I liked: I’ve read this series when it first came out, took a break because so many books, not enough time, and Ms Laurie has found a way to keep it fresh and entertaining. I’m to the point where I would really love to hang out with Abby and Candice. Yes, they’re best friends but their personalities complement each other in a great way. In A Panicked Premonition, the emphasis is on a new business Dutch (Abby’s husband, FBI agent) 4.5 Stars! In A Panicked Premonition, the emphasis is on a new business Dutch (Abby’s husband, FBI agent) and Brice (Candice’s husband and Dutch’s boss at the FBI) have begun with their all-round handyman and friend, Dave. I love Dave! Their business is installing panic rooms and business is booming but so is murder. First Dave goes missing, then 2 clients are murdered and all the info points to Dave. As a matter of fact, the evidence is so overwhelming that his friends are even questioning their knowledge of him. Never fear, Abby and Candice are on the case with a heavy assist from their guys. Sounds simple, doesn’t it? It’s not and Ms Laurie has changed things up a bit. First off, Abby is the queen of unhealthy eating but evidently some time has passed since the ending of the last book, A Grave Prediction, and Abby is working out, eating really healthy, and enjoying it. Wow, I did not see that coming. Seriously though, there are a few subplots that turn out to have a bearing on the case, or not? Abby is one of my favorite characters in a series. If taken alone, she could become obnoxious very quickly but the snark, the childish actions, in some cases her self-absorption would lose my interest quickly. Ms Laurie has a gift of knowing when each part of Abby’s personality fits what scene or when it’s not all about her but the family and friends around her. I did not figure out the bad guys, well, maybe I did a bit but not completely. I also enjoy the relationships between the main characters. Yes, there is a bit of drama but overall, the characters feel like regular people dealing with their respective careers and all that entails. Well, of course, I’ve never met a regular psychic person but Abby is just herself with a little help from her guides in the ether. She has to work at interpreting what they are trying to convey to her and her gut doesn’t always warn her in time and mayhem ensues. The relationship between Abby and Dutch is loving and comfortable but they are each individuals who respect each other and accept each other as they are. The same can be said of Abby and Candice. Ms Laurie pairing them as partners was a fantastic choice and I think has extended the life of this series. What I didn’t like: A Panicked Premonition is the 15th book in this series and the only thing that jumps out at me is Abby’s insecurity when dealing with people who don’t believe in her psychic powers. Then I started thinking, even at my advanced age, there are still things I’m insecure about that have followed me most of my life. So basically, nothing not to like. I know Ms Laurie is having some issues finding a new home or perhaps self-publishing in continuing this series. As a reader, I can tell that Ms Laurie puts her heart and soul into her writing. Her books reflect her research in the setting, her plots are interesting but not over the top unbelievable, and her characters won my heart from the beginning. I’m looking forward to more of Abby’s adventures! I received an ARC from NetGalley for an honest review. This book came out right when I needed it. I've had the past couple of weeks off from work and thought I'd be reading non-stop. I've started several books at the moment that I have enjoyed, but I just haven't felt too motivated to sit down and read. Well, this book brought me out of my slump. I don't even know how many books we are into this series, but I always love the Abby books. This is book number 15 in the series, and I hope there will be 15 more. This one had so many twists and turns that This book came out right when I needed it. I've had the past couple of weeks off from work and thought I'd be reading non-stop. I've started several books at the moment that I have enjoyed, but I just haven't felt too motivated to sit down and read. Well, this book brought me out of my slump. I don't even know how many books we are into this series, but I always love the Abby books. This is book number 15 in the series, and I hope there will be 15 more. One of my favorites in the series, probably because the mystery was very exciting and intricate. It kept me guessing and turning pages. And of course, Abby, Candice, Dutch, Brice and Nikki were as fun as ever. Psychic and FBI consultant Abby Cooper and her gun-toting, Porche-driving business partner Candice Fusco, and their FBI agent spouses Dutch and Brice, respectively, (honest, I did not make those ridiculously macho names up) all live and work in Austin, Texas. As a sideline to their lucrative work as Special Agents, Dutch and Brice install panic rooms in absurdly wealthy peoples' homes. When a particularly brutal execution-style murder happens at one of their clients' homes, and a business partne Psychic and FBI consultant Abby Cooper and her gun-toting, Porche-driving business partner Candice Fusco, and their FBI agent spouses Dutch and Brice, respectively, (honest, I did not make those ridiculously macho names up) all live and work in Austin, Texas. As a sideline to their lucrative work as Special Agents, Dutch and Brice install panic rooms in absurdly wealthy peoples' homes. When a particularly brutal execution-style murder happens at one of their clients' homes, and a business partner named Dave is implicated, Dutch and Brice are both subjects in the investigation as well as active agents participating in the investigation. Whiskey. Tango. Foxtrot. As though that would be allowed. Can no one in the Lone Star State say the words "conflict of interest"? And if that's not problematic enough, as one couple and two of their workers are murdered, and a second couple goes missing, it occurs to no one--including the freaking psychic--to check the panic rooms of all of their clients, esp. those who are out of town, for the missing people. Ugh. Seriously, this so-called mystery would have only been vapid had it not included the participants' admitted willingness to plant evidence and twist the very law they themselves are supposed to uphold in an instance where it appears that a highly-remunerated sleazy lawyer is about to get a bad guy off. And that's okay exactly how? Abby's new diet and fitness regimen takes a fast backseat when Dave the former handyman not only goes missing but is suspected of murdering his and Dutch's wealthy clients. The ether feels bad in this particularly frustrating case. Readers finally learn Dave's "old lady"'s real name just as they're wondering if he's been lying to Abby and Dutch for years. Not much is as it seems, as the 1% strives to protect their own while Abby's crew tries to find AND clear Dave. The action picks up fast and roll Abby's new diet and fitness regimen takes a fast backseat when Dave the former handyman not only goes missing but is suspected of murdering his and Dutch's wealthy clients. The action picks up fast and rolls steadily throughout the story. This was one of the only Psychic Eye books in which my hunches were wrong as often as they were right. Once again Abby has to solve a case involving a friend that is linked to her husband and herself. Sorry that type of case is getting old not just in this series but all series. I did find myself getting pulled into the twist and turns because of the writing but I found myself getting lost in a couple of places while trying to keep track of what all is going on. Abby has grown so much but the lack of her abilities being showcased more in solving the case was a big turn off. Something else was a l Once again Abby has to solve a case involving a friend that is linked to her husband and herself. Sorry that type of case is getting old not just in this series but all series. I did find myself getting pulled into the twist and turns because of the writing but I found myself getting lost in a couple of places while trying to keep track of what all is going on. Abby has grown so much but the lack of her abilities being showcased more in solving the case was a big turn off. Something else was a little off in this book, I just can't put my finger on it. I am still giving it three stars and it was a quick fun read. Absolutely chilling with such high energy I could barely catch my breathe! Abby, partner Candice, & their respective FBI husbands Dutch & Brice are locked in a desperate race to save their good friend Dave & prove his innocence in a very grizzly, horrendous mass murder. A few catch your breath moments are provided by some snappy banter between Abby & Candice, & lots of sensual interludes between Abby & breathtaking hubby Dutch. Abby's psychic sense provi Spectacular!!!!!! DD 02 Jan 2017. Aaaaand now I want more of Abby! More! And as it has become a tradition of mine to rate books of this series a bit (lot!) earlier than I can actually get my hands on it in order to be able to happily reinforce this rating at a muuuch later date post factum. My favourite series about Abby rules on! I really hope there are lots of further books down this road for me. Thought I was in the mood for something really light. Just couldn't get into it, there were too many OOC moments, the cutesy language wasn't working for me, and had more violence than I expected from a cozy mystery. Ended up skimming, and read the conclusion just to verify that I knew whodunnit. Professional psychic and FBI consultant Abby Cooper has used her inner visions to get her out of many a scrape and solve many a crime but she’s about to face a murder scene that will put all her powers to the test. Abby’s husband Dutch has a side business providing security and building panic rooms for wealthy clients. One morning, one of Dutch’s partners, Dave, goes missing on his way to meet a client. Abby’s intuition tells her something terrible has happened to him. Then two of Dutch’s clients are found brutally murdered…inside their brand new panic room, and most of the evidence points to Dave as the killer. With the authorities racing to find and arrest him, Abby’s got to use all her intuitive prowess to get to Dave first, discover the real killer, and save her husband’s business. This is one case where Abby is positive there’s far more to this mystery than meets her inner eye. A Panicked Premonition is only the second book I have read in the “Psychic Eye Mystery” series. I take it this series must have a huge fan base as this is the 15th book. I enjoyed the one right before this one, A Grave Prediction #14. The protagonist is Abby Cooper, a P.I. who works with the FBI as a consultant alongside her friend Candice. Both of their husbands work for the FBI. I really enjoyed Abby and her use of her psychic abilities to help with case in the other book. Not so much this one since she used it rarely and not for what I thought would be the perfect times. The ladies husbands have a new business that is going well. Dutch(FBI agent and Abby’s husband) and Brice (Candice’s husband and Dutch’s superior at the FBI) have started a business installing panic rooms. Everything is going great until their handyman/builder Dave goes missing. Then things really go bad. I went into reading the “Psychic Eye Mystery” series thinking they are cozies. Well they are and they are not, more not. If you enjoy the brash language of authors like Evanovich, this will not be a problem. I can read past it. They are a bit harsher than a real cozy. The murder is gruesome, the action is on the page not implied and Abby is not an amateur for sure. That said, I could get past all of that even though cozy is my usual genre’. Author Victoria Laurie is adept at pulling the reader in and keeps things moving. I enjoy her writing style. Her storyline was intriguing, but I was very put off that Abby seemed to barely use her abilities when I felt they were needed most. And no one seemed to say anything. That was just odd to me. I really wanted to give this one 3 stars because of Abby seeming so off in her investigating. The author’s writing style did, however pull it up to 4 stars. Dave is an integral part of the team in the panic room business. When he goes missing, everyone has to get involved. Abby has a bad feeling and that makes everyone take notice. Bits and pieces start to turn up in the hunt for their friend. Things really get hairy when Abby and Candice go to the house Dave had been working on and it is a horrific scene. What could possibly have happened for these people to be murdered, no more like butchered. Now it looks like Dave is the suspect and it looks really bad when he cannot be found. What could have happened? Although Abby can see some of the mayhem, she cannot get it all. So the only thing they can all do, investigate and find their friend. The evidence is so bad that even they start to think Dave could be the culprit. I am not sure why I did not care for A Panicked Premonition as much as the one previous to it, but I think it has to do with Abby’s special ability. I enjoy the author’s writing style, not as a cozy read, but as a mystery straight and simple. I would recommend this one to anyone that enjoys a mystery with a psychic and a great group of main characters. I wish I had known Abby when she was eating all the junk food though, not a fan of all the workout/running/eating right scenes. I am a bit surprised at how different the last book and this one seemed to me. Not sure what is behind that, but I would still recommend this read. The mystery was hard to figure out, I thought I had it then I did not, then I did. That was good. The clues are interesting and the search was intense. There are a lot of really good points to A Panicked Premonition and I think most mystery/psychic fans will enjoy reading it. The characters are well developed and well rounded. I really love Abby and Candice. They are more than best friends, they are as close as sisters. We should all have a Candace in our lives. When they found out that their friend, Dave, has disappeared, they never hesitated in trying to find him. And when it looked like Dave was going to be accused of murder, they worked doubly hard. I enjoy the way their husbands acted like they are in control of everything but really the girls are in charge. I enjoyed getting to spend more time with all of them. The writing style flows smoothly and the book is a quick easy read. The author is very talented in her descriptive writing and through much of the story, I felt like I was right there, watching all of the action taking place. I could imagine the mansions and estates that Abby and Candice visited, and see how the rich live. The mystery was carried on well throughout the entire book. There were quite a few suspects to consider and clues to sift through and it was not an easy mystery to solve. Throw in some red herrings and even the most experienced armchair detective will struggle with finding the correct culprit. I really like that not only did Abby and Candace have to figure out how Dave was involved in the murders (Abby refused to believe he was responsible) but they also had to find Dave before it was too late. Having two mysteries to solve is twice the fun. I would recommend this book to anyone who enjoys a well crafted cozy mystery. If you enjoy paranormal cozies, this book is a must read book. I felt this was a more edgier cozy, with harsher language than is typical for cozies, but that did not dim my enjoyment of the book in any way. In the latest installment of the Abby Cooper series, Abby's handyman and dear friend Dave finds himself in a pickle, we learn his wife's actual name, and the Scooby gangs future all get tossed upside down and turned inside out as they work on the most emotional and intense investigation to date! Will this be the end of the road for the trio of besties, or will they get their happily ever after? Lets find out! The story takes us back to Dutch's side business involving his security company that mor In the latest installment of the Abby Cooper series, Abby's handyman and dear friend Dave finds himself in a pickle, we learn his wife's actual name, and the Scooby gangs future all get tossed upside down and turned inside out as they work on the most emotional and intense investigation to date! Will this be the end of the road for the trio of besties, or will they get their happily ever after? Lets find out! The story takes us back to Dutch's side business involving his security company that more recently included Bryce and Dave. The company provides safe rooms for the rich and filthy rich. While on the job, Dave goes missing. When Abby receives a call from his beloved wife, (and no, I'm not spoiling that for you!) that Dave has not returned home all night, Abby gets a bad juju vibes from the ether. Abby takes immediate action and starts the phone tree to Dutch and the gang. While investigating his disappearance, Abby and Candace stumble upon a doozy of a story to follow that leads to very bad things. All the while Dave's "old lady" is hanging on by a thread, terrified that something horrible has happened to him and she will possibly never see him again. I found the story began very intriguing, but as time went by, I was very confused as to why in this particular case Abby was unable to get a grip on any info from the ether about Dave. It was very frustrating at times, however, I later come to the conclusion that the reason may have been because she is so emotionally tied to Dave and therefore that clouded her insight. With the murder case that tied Dave to the crime, the APD became involved complicating Abby and friends search for their friend. The story line had a similar ring to an earlier story where Candace was "wanted" for a crime back in Las Vegas, and in turn left me feeling like the series was repeating earlier stories now. I did enjoy the plot and the possibilities for the gang's future this book opened up, and I hope that this is why Dave had to suffer the similar story line Candace had in an earlier book. The true depths of Dutch and Abby's love for one another, which were brought forth once again, gave me goose bumps, and also reminded me of why I love this couple so much. They truly are soul mates in every sense of the word, and it brings me so much joy to see Abby experience true happiness after growing up in a family that was not so loving. So in closing for all the Abby Cooper fans out there, I don't think you will be disappointed with Panicked Premonition, but you may feel a sense of dejavue. I will without a doubt continue to anxiously await the next adventure that Abby and friends will have! My thanks to Netgalley and the Publisher for an opportunity to read an advanced copy of this book. I love it when I am reading a mystery and begin to have my own “but what about” questions and then one by one the author answers them. “It’s like she gets me” (ok, you will have to read the book to get that reference). This is a unique series in that fourteen or so books back this was a cozy mystery series and within time, they have shifted more to a regular mystery with parts and subjects that are My thanks to Netgalley and the Publisher for an opportunity to read an advanced copy of this book. This is a unique series in that fourteen or so books back this was a cozy mystery series and within time, they have shifted more to a regular mystery with parts and subjects that are on the un-cozy side yet you forgive Victoria Laurie because, as a writer, she is growing. With a twisty plot that involves dear friend Dave and the new panic room business that Dutch and Brice have started, now that Milo is no longer in the picture, things go sideways quickly when there is a double murder at a recent project and Dave is nowhere to be found. Abby and Candice are the main focus in this book and in between working out, the ladies tend to be going back and forth between their private investigator skills and their being on the FBI payroll. Guess you walk on a very narrow edge when you husbands are with the FBI and they need their girlfriends to solve crimes. Another stellar entry in the Abby Cooper, Psychic Eye series. In this one, Abby and crew are on a mission to clear friend and coworker Dave's name after he becomes prime suspect in the murder case of one of Dutch's wealthy clients. Not only is this case full of disjointed clues that lead the team in circles, but it also contains a sort of "chaotic energy" that messes with Abby's intuitive abilities to make accurate predictions. The plot is just thick enough to keep you guessing without being too Another stellar entry in the Abby Cooper, Psychic Eye series. In this one, Abby and crew are on a mission to clear friend and coworker Dave's name after he becomes prime suspect in the murder case of one of Dutch's wealthy clients. Not only is this case full of disjointed clues that lead the team in circles, but it also contains a sort of "chaotic energy" that messes with Abby's intuitive abilities to make accurate predictions. The plot is just thick enough to keep you guessing without being too complex, and Laurie throws enough red herrings in the mix to keep you wondering whodunnit up until the last 20 pages or so. My only criticism would be the overuse of monologue/dialogue to inform the reader of the killer's motives, but I suppose that's pretty common in mystery novels. This series has become one of my favorites. Even though this book is #15, it manages to maintain its staying power and even continues to improve. Also, Laurie proves that it's possible to write a successful mystery with a happily married couple as its main characters, proving that you don't need a stupid love triangle to keep readers engaged. I’ve read and enjoyed all the books in the Psychic Eye cozy mystery series by Victoria Laurie. In the latest book in the series, A Panicked Premonition, psychic Abby Cooper’s husband Dutch has started a new business building “safe rooms” in the homes of the very wealthy in Austin, Texas, while also still working for the FBI. His partners are their friends Brice, who is Dutch’s boss at the FBI, and Dave, a master carpenter. One morning Abby and Dutch get a panicked call from Dave’s wife, Gwen. Dav I’ve read and enjoyed all the books in the Psychic Eye cozy mystery series by Victoria Laurie. 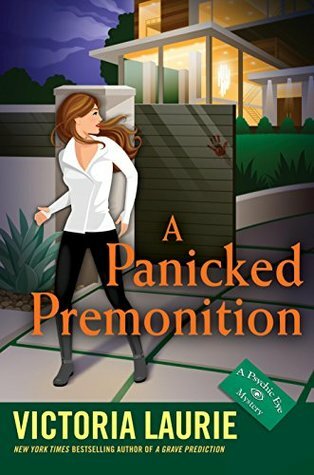 In the latest book in the series, A Panicked Premonition, psychic Abby Cooper’s husband Dutch has started a new business building “safe rooms” in the homes of the very wealthy in Austin, Texas, while also still working for the FBI. His partners are their friends Brice, who is Dutch’s boss at the FBI, and Dave, a master carpenter. One morning Abby and Dutch get a panicked call from Dave’s wife, Gwen. Dave has disappeared. Abby and Dutch investigate and realize Dave went missing the previous day while driving between business appointments. Before they can get a lead on Dave, Gwen is kidnapped. Abby’s psychic sense tells her that both Dave and Gwen are in grave danger if Abby, Dutch, Brice and Candace (Abby’s friend and Brice’s wife) don’t find them soon. The books in this series are all fun, fast-paced, humorous reads that pack a lot of entertainment into each hour of reading. Abby and the gang are back and up to their usual tricks. I didn't feel like Abby used her psychic abilities as much in this book as in others, but overall if you've liked the others in the series, this one will be a nice addition. Professional psychic and FBI consultant Abby Cooper has used her inner visions to get her out of many a scrape—and solve many a crime—but she’s about to face a murder scene that will put all her powers to the test. Abby’s husband Dutch has a side busine Abby and the gang are back and up to their usual tricks. I didn't feel like Abby used her psychic abilities as much in this book as in others, but overall if you've liked the others in the series, this one will be a nice addition. This is the first Victoria Laurie book that I had a hard time reading. Its like I just couldn't get in the story (with this said- I also moved to a different state and started a new job while reading this book)- so perhaps, it was more on my end than the book? I like the changes in Abby. I think as a human being we change. We try to be healthier. We have days where we still want five burritos. And when you're in a happy marriage- you may sexualize your husband in the context of your mind. So when This is the first Victoria Laurie book that I had a hard time reading. Its like I just couldn't get in the story (with this said- I also moved to a different state and started a new job while reading this book)- so perhaps, it was more on my end than the book? I like the changes in Abby. I think as a human being we change. We try to be healthier. We have days where we still want five burritos. And when you're in a happy marriage- you may sexualize your husband in the context of your mind. So when I read people that mention these things in a negative context, I roll my eyes. I think that I wasn't digging this book as much as I want to was that the connection to Dave felt lacking and that was the main reason for taking the case. In the beginning it was established and mentioned, but I wanted more from Dave's connection to the mystery. I don't know. Maybe it was just me? This shouldn't dissuade you from reading this book because I absolutely adore this series from Victoria Laurie. It just wasn't my favorite in the series. This is my second Abby Cooper book. Yes, I know, a little late to the game. However, this character is really growing on me. I thoroughly enjoyed reading reading this book. Lots of quirky characters, action and suspense. All right up my alley! This one involved a murder in a panic room. What? Isn't that where you go to be safe if your house is being invaded? Abby's husband is seriously involved in this on a very personal reason. His side company builds panic rooms and. . . they just happened to b This is my second Abby Cooper book. Yes, I know, a little late to the game. However, this character is really growing on me. I thoroughly enjoyed reading reading this book. Lots of quirky characters, action and suspense. All right up my alley! This one involved a murder in a panic room. What? Isn't that where you go to be safe if your house is being invaded? Abby's husband is seriously involved in this on a very personal reason. His side company builds panic rooms and. . . they just happened to build this one. Getting to the bottom of this one has Abby meeting a lot of people that she would rather not meet. (I love the barbs she self consciously throws out!). Trying to figure this one out has everyone involved and I sped through this book. There are also lots of suspects with the main one coming to everyone's list, except Abby and the team, is Dave, Dutch's good friend and employee. Lots of laughs to go with all the action, definitely an entertaining read. This review has been hidden because it contains spoilers. To view it, click here. Around the Year in 52 Books 2017 Reading Challenge. A book that is a continuation of the story. Milo has retired and Dutch has taken on Brice and Dave in his security company which lately is specializing in safe rooms (also known as panic rooms). Then Dave mysteriously disappears and Abby and Candice stumble upon a home invasion/murder/robbery of one of their safe room customers. Worse yet, Dave is implicated in this crime. They are desperate to find him and certain he is not guilty, but he is ce Around the Year in 52 Books 2017 Reading Challenge. A book that is a continuation of the story. Victoria Laurie is the New York Times bestselling author of 30 books and counting. Victoria divides her time between her two adult mystery series, (The Psychic Eye Mysteries, and The Ghost Hunter Mysteries), and a Y/A thriller, When (Formerly titled Death Date), to be released in early January of 2015. As a professional psychic, Victoria's protagonists - psychic Abigail Cooper, and spiritual medium Victoria Laurie is the New York Times bestselling author of 30 books and counting. Victoria divides her time between her two adult mystery series, (The Psychic Eye Mysteries, and The Ghost Hunter Mysteries), and a Y/A thriller, When (Formerly titled Death Date), to be released in early January of 2015. As a professional psychic, Victoria's protagonists - psychic Abigail Cooper, and spiritual medium M. J. Holliday - tackle the tricky world of the paranormal while fighting bad guys and demons with plenty of plucky humor and determination. And using that keen understanding of the paranormal, Victoria also created the character of Maddie Fynn, a teenager with the unique intuitive ability to predict the exact date of someone's death. To showcase her writing range, Victoria has also penned a children's epic adventure series, The Oracles of Delphi Keep.